This page is regularly updated as new products come out. This page was last updated April 21, 2019. Basically all of the links on this page are affiliate links. You can support me by making any purchase (not just the linked item) at the store after clicking the store's affiliate link on this page. Read our Affiliate Link Policy for more information. If this will be your first time ordering from Banggood, you should know a few things. Ready-to-fly (RTF) racing drones are the fastest way to experience FPV. They require no assembly and minimal setup. Let's be clear: RTF racing drones are not a way of getting out of learning to build and repair. An RTF quad is perfect ... until you crash it. Eventually, it'll break and you'll need to either buy a whole new quad or fix it. There are two main reasons to buy an RTF kit. An RTF quad lets you get into the air immediately. It can be incredibly frustrating for a beginner who is addicted to FPV to wait through a first build experience. You can be enjoying an RTF quad at the same time as you're working on your first self-built quad. Second, an RTF quad lets you experience what a well-built and well-tuned copter flies like. Let's face it: your very first build isn't going to be the best it possibly can be. Once you fly a good quality RTF, you have some idea of what to shoot for. Okay. There's one more reason to buy an RTF. A few of them are legitimately great quads. As good as anything you'd build for yourself! Maybe we're finally at a point where we don't have to make excuses for buying an RTF. You think? The quads in this category are 100% ready to fly. This means that they come with a transmitter and they are totally pre-configured. All you have to do is plug in the battery, turn on the transmitter, and go. If you want the easiest possible way of getting into the air, this is it. The Wizard X220 has gotten more people into drone racing and FPV than any other quad. The main reason for this is its price. For under $200 you get literally everything you need to put the quad into the air, including a battery and battery charger. You even get a bunch of spare props (and you'll need them). I need to be straight with you. The Wizard X220 is the absolute bare minimum of what I would recommend to give you the experience of flying FPV. If you have exactly this much to spend, and not a dollar more, then buy the X220 and enjoy it. But if you can spend more, you should. Because everything else on this page will give you a better experience in nearly every way. The X220 breaks easily. Its electronics are not very reliable (the ESC's and flight controller in particular are prone to spontaneous failure). Within a few weeks or months of buying the X220, you will almost certainly have upgraded to something better or replaced enough parts that you could have bought something better. So if you can spend more on something better, you should just do it up front. But if you absolutely can't spend another dollar and you want to get into FPV, buy the Wizard X220 with my blessing, and enjoy. The Grayson Hobby product link above costs a bit more than the Banggood one. Grayson personally inspects and then hand-tunes and configures each Wizard before they ship it. This is the kind of thing that a beginner pilot might overlook and then wonder why their quad isn't flying as good as it should. Grayson ships from the U.S. They have a direct support line for customers. And they stand behind their warranty. If you're in the U.S. and you're a first time buyer, the additional money spent buying from Grayson is probably worth it. The Arris X220 is the cheapest RTF that I'd call a "real racing drone". It chooses affordable parts, but not bargain-basement junk. The frame is well designed, especially for a beginner who is going to crash a lot. It is capable at either racing or freestyle, although the motors are intentionally selected to be a little under-powered, to make it easier for beginners. There are two links above. One is to a version with the RadioLink AT-9 radio. The other comes with the Taranis QX7. The RadioLink AT-9 is a decent transmitter that you could keep using for years. But the QX7 is far, far more popular and capable. It's also more expensive... so decide for yourself. If you expect to be in the hobby for the long haul, the QX7 is 100% worth the price. With the RadioLink radio, the X220 comes in about $60 more than the Wizard X220. In addition, you'll need to buy your own batteries, charger, and props. But here's the thing: if you bought the Wizard, you'd be buying that stuff in a couple weeks anyway. So basically for $60 more, you get a much, much better quad, and a transmitter that you'll stick with. That's why the Arris X220 is my Best Value For Money choice. Team BlackSheep is one of the top manufacturers in the FPV industry. 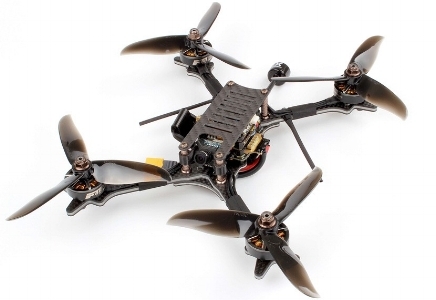 The Oblivion is their latest entry into the RTF racing drone market. 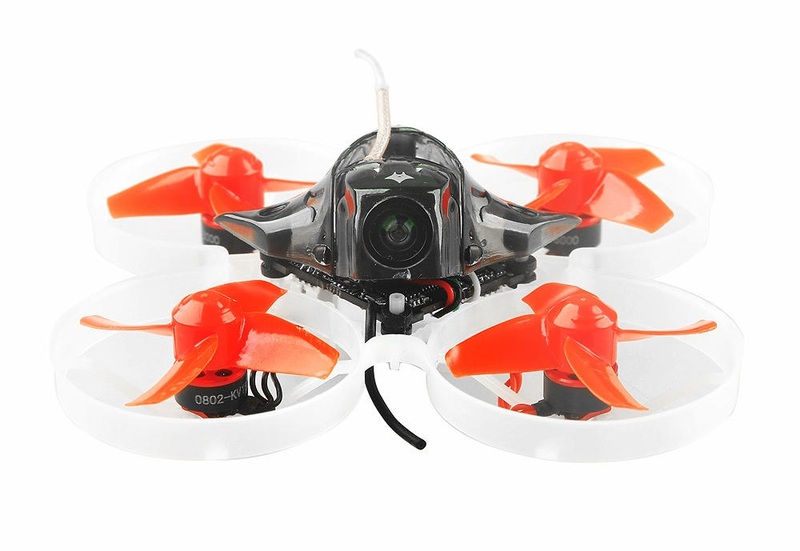 The Oblivion quad uses a molded plastic shell to provide aerodynamic handling and durability. TBS PowerCube electronics allow for no-solder replacement of parts when damage eventually occurs. The RTF kit includes the TBS Tango radio, which has a built in 5 GHz video receiver and screen. You'll have to buy those separately with some other kits. The Oblivion also uses the TBS Crossfire long-range control link, which gives unparalleled range and link reliability. This is a premium upgrade option that nobody else can touch. The Tango's specs surprise some people: the motors are not the most powerful, for example. The reason for this is that it's trying to be a little bit of everything: a fast racer and an efficient, long-duration beginner rig at the same time. The fact is, it'll still out-perform some other RTF kits that look more impressive on paper because of its quality construction--especially once you start crashing, and durability comes into play. The Emax Tinyhawk RTF bundle is the best way for a beginner to get started with FPV. Here's why. The Tinyhawk is a fantastic micro-sized quad. It flies great. And it's durable as hell. Most people who own it have never even changed a prop. You can crash it and crash it and it will just keep flying. The Tinyhawk comes set up for beginners, with autolevel mode active, and slow rates that make it as easy as possible to control. But the Tinyhawk is so much more than a starter-quad. Once you gain confidence, you can set it to acro mode and up the rates, and holy cow, it flies amazing! You won't outgrow this quad. You'll grow into its capabilities. The goggles that come in the RTF bundle are bright and clear. Their resolution isn't the highest, but they're more than acceptable for a beginner just learning. When you eventually outgrow the goggles, you'll still keep them around for spectators to enjoy the experience of FPV. So many people looking to get into FPV choose the Eachine Wizard X220 (above). I think that's a mistake. The Wizard is, in every way, a sub-standard quadcopter. It breaks too easily. And the Wizard RTF doesn't include goggles. With the Tinyhawk RTF bundle, you will get a fantastic micro-sized quad that you can enjoy forever. It's not a big, powerful 5" quad... that's true. But if you learn on the Tinyhawk, by the time you're ready for a 5" quad, you can spend your money on something way better than the Wizard and know that you're ready for it. These quads don't come with goggles or a transmitter, so they're perfect if you have specific preferences or if this isn't your first quad and you already own some gear. You get more for your money, since you're only buying the quad and not any accessories. On the flip-side, if you are buying one of these as your first quad, you need to pick up a few other things from this list before you'll be able to fly. Plug-N-Play quads come without a receiver. You install your own receiver in the quad. This means you can use a PnP quad with nearly any modern transmitter, regardless of whether it's FrSky, FlySky, Spektrum, RadioLink, Futaba... you name it. Bind-N-Fly quads come with a receiver pre-installed. No soldering is required--just bind the receiver to your transmitter. The quad will also typically come pre-configured for the type of receiver that is installed, so there is a bit less setup to do. The limitation of Bind-N-Fly quads is that they may not come with the type of receiver you need. For example, a quad might be available only with FrSky receiver; if that's not what you own, you wouldn't want to buy that (or at least you'd need to replace the receiver after buying it). As much as I love to build quads, I have to admit that this is one of my favorite sections of the site. Pre-built quads have gotten SO GOOD lately. It's really fun to be able to showcase them. The NewBeeDrone AcroBee is a 65mm sized micro quad. It has tiny props and ducted motors so it's safe to use indoors. The BeeBrain V2 flight controller runs Betaflight, which means configuration is the same as any bigger quad. It's even got Betaflight OSD (on-screen display) that lets you monitor vital stats like battery voltage and flight time in your FPV goggles. The AcroBee is an ideal learner quad. It's durable, easy to repair, and it won't even scratch up your walls when you crash it. But don't let that fool you into thinking it's only for beginners. Flying through your house--under the table, between the chairs, over the dog--gives even experienced pilots a certain glee that no other FPV experience can match. I can honestly say I have never had as much fun flying FPV as when five friends and I sat around the living room racing this style of quad all afternoon. When both the quad and the race track are tiny, the sense of speed and thrill of competition is the same. But the stakes are so much lower with a tiny quad that everyone can just relax and have fun. And you don't have to walk as far when you crash either. The Acrobee can be ordered with either Spektrum (DSMX) or FrSky receiver on board. The receiver is integrated into the flight controller, so other transmitter types are unfortunately out of luck. For about $40 more, consider ordering the Full Kit, which includes batteries, a charger, and a few other accessories. This little quadcopter straddles the line: it's small and has guarded props so it's safe like a Tiny Whoop, but it's got brushless motors which give it the speed, durability, and power of a larger quad. It still won't hold its own against machines with 2" and larger props, like the Babyhawk-R, but that's not the point. You can fly the Mobula inside your house and not worry about marking up the walls or putting the cat's eye out. You can fly the Mobula at a park and not worry about annoying people with sound or spinning blades of death. The real beauty of the Mobula 7 is its versatility. That versatility extends to the Mobula 7's power system. It runs on the same batteries as regular Tiny Whoops like the Acrobee. With an included adapter, it can run on one-cell voltage for beginners or two-cell voltage for more experienced pilots. Speaking of "included", the "standard" kit includes an excellent battery charger that is more than worth the small increase in price. Definitely skip the "basic" kit and get the "standard". There will always be purists who prefer the brushed motors, smaller size, and lighter weight of the Acrobee and its kin. I respect that. But for most people, I think the Mobula 7 will be more fun, more versatile, more durable, and overall a better value. The Emax Hawk 5 might be the best bind-n-fly racing quad available. Emax has done almost everything right with this one. It's fast. Nimble. Durable. It's even got a custom PID tune developed by pro racers just for it. The Hawk 5 isn't perfect. It only comes with a FrSky receiver, and the receiver is direct-soldered to the flight controller. So if you don't use FrSky, you'll have to do a bit of surgery to get your receiver installed. The video transmitter doesn't support remote control (SmartAudio) so you have to push a button to change channels and band. vTX remote control has pretty much become the norm, so it's a little disappointing to see it missing on the Hawk. Finally, if you're a freestyle pilot, you'll have to bottom-mount the battery in order to put a GoPro up top, which many freestyle pilots don't like. Don't let any of that discourage you. In my review of the Hawk 5, I said, "If you want to spend about $250 on a quadcopter, and you don't want to have to build it yourself, don't hesitate, buy the Hawk 5 today." I still mean it. The Hawk 5 is a shockingly good BnF racing drone, and at a price of about $250, it's an absolute steal. Purchase at Banggood - 2" and 3"
Purchase at RaceDayQuads - 2" and 3"
The Emax Babyhawk is the quad that convinced me that 2" and 3" sized props had come of age. People always promised of micros, "No really, it flies like a five-inch!" The BabyHawk was the first quad that actually delivered. The Babyhawk is a little too powerful to be an ideal learner quad. It can be flown indoors, if you're a good pilot, but it'll leave a mark when it crashes. It'd be an ideal choice for anyone who doesn't quite feel ready for a 5" quad yet. Or for someone who flies in very tight outdoor environments and wants a little more maneuverability and control than a 5" can offer. It's light enough to survive crashes with little more damage than a broken prop, but it's got plenty of power to do true racing and acro freestyle. To really wake it up, swap the arms for slightly bigger aftermarket ones and mount 3" props on its motors (they can take it). Or just buy the 3" version to start with. The Babyhawk-R is available in a Bind-N-Fly Frsky version, or a Plug-N-Play version for all other transmitter types. Make sure to use the smallest receiver possible, as there isn't much room under the hood. When you think of the Diatone GT-M530, don't think of a high-revving racer. Think of a growling muscle car. The GT-M530 is a little bit heavier, but it makes up for it with powerful motors. It doesn't corner quite as sharply as a purebred racer, but hit the throttle in a straight and it'll blow your hair back. This makes it perfect as a freestyle quad--a little less suitable as a racer (although it'll still get around the track). The main reason the GT-M530 is heavier is because Diatone has designed to be extra-durable. Thick 5mm base plate. Metal body. This is a quad that you can crash and crash and it'll come back for more. And if something does break, the parts are all available for purchase individually. Some can even be changed without soldering. The first generation of this quad was my recommendation for "best RTF racing drone". Holybro has modernized the design and updated all the specs. The Kopis 2 is even better than its predecessor! Every part on this quad is premium. Start with the Kakute F7 flight controller with soft-mounted gyro, which allows you to run 32k sampling without noise issues. The Atlatl V2 video transmitter goes up to 800 mW. It fully supports vTX remote control (change channels and power without touching the quad). The Tekkos32 ESC runs BLHeli32 (the latest and greatest) and was hailed by Drone Mesh as one of the best ESCs available. Motors are T-Motor F40 Pro-II... one of the best mini quad motors available today. Often times, you sacrifice something for the convenience of a pre-built quad. Not here. The Kopis 2 is the closest a factory-built quad can get to a hand-made racer or freestyle rig. The other quads on this page are built on an assembly line. But sometimes, you want to know that one person built your quad, just for you. You want to be able to reach out to the exact people who built your quad if you run into trouble. Maybe you even want to be able to customize the build to your exact specs. The quads in this section are hand-built by technicians who are actual drone racing pilots. They're individually test-flown before they ship. When you buy a quad from this section, you're not just getting the same parts that a pro pilot would use, you're getting the actual quad that a pro pilot would (and did) build. Armattan is well known for its popular freestyle frames: the Chameleon and the Rooster. They come with a lifetime warranty on all frame parts so you can go all out without being afraid of breaking an arm or a bottom plate. My personal choice would be the 5" Chameleon Ti frame with Armattan's Titan 2306/2450kv motors, and the SRC Bucaneer video transmitter (because of its MMCX antenna connector, which I believe is more durable than the uFL connector on the Unify). Catalyst Machineworks makes innovative, pure-bred racing quadcopters. Choose the Norris frame for a traditional carbon-fiber design, or the 'Merica for a versatile and light 3D printed canopy. The builders at Catalyst are some of the best in the industry, turning out tightly-tuned, high-performance racing drones that you could literally take out of the box and put right on the starting block of a race. Catalyst prides itself on its bespoke service. When you order a Catalyst quad, you're not just picking a product off a shelf. Feel free to discuss personalization and customization options. Catalyst is up to the challenge.